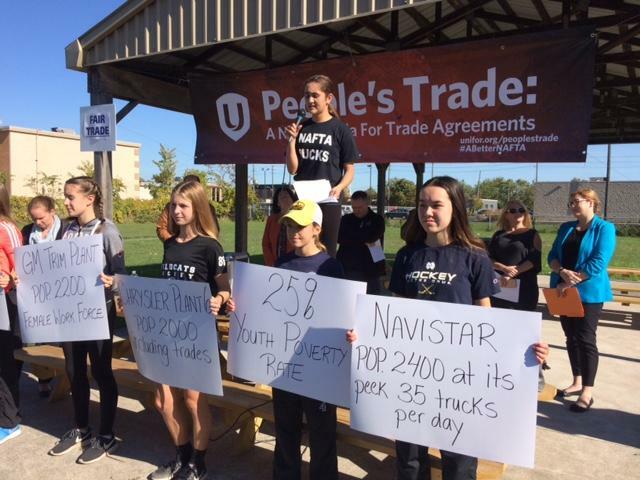 Last week, nearly 60 representatives of unions and civil society organizations from Mexico, Canada and the United States gathered in Chicago for a two-day meeting to discuss strategies for collaboration as their governments renegotiate the 23-year-old North American Free Trade Agreement (NAFTA). The meeting was coordinated by the United Electrical Workers (UE), UCLA Labor Center and Rosa Luxemburg Stiftung, an international civic education institution affiliated with Germany’s Left Party. While many Mexican unions are dominated by the government, only the country’s more independent and democratically run labor organizations attended. Critics argue that NAFTA has accelerated the global “race to the bottom,” where governments dismantle workplace and environmental protections in order to attract capital investment. “NAFTA has had many negative impacts. Big companies come to Mexico accommodated by the government as workers’ rights are constantly violated,” Julia Quiñones, coordinator of the Comité Fronterizo de [email protected], or Border Workers’ Committee (CFO), told In These Times. CFO organizes maquiladora workers in the northern Mexican states of Tamaulipas, Coahuila and Chihuahua. The foreign-owned maquiladoras along the U.S.-Mexico border, which produce goods for export, embody the most pernicious aspects of “free trade”: exploiting low-paid, majority-women workers and polluting their surroundings. Quiñones explained that maquila workers often face sexual violence from their managers, are exposed to dangerous chemicals, work 12- to 14-hour days and are frequently fired or blacklisted for trying to organize. The tri-national participants in last week’s Chicago gathering protested outside the Mexican Consulate Friday afternoon, calling on the government of President Enrique Peña Nieto to listen to the demands of Mexico’s workers in the NAFTA renegotiations. Adhering to neoliberal orthodoxy, Peña Nieto’s negotiators say that more trade, not more labor protections, will benefit workers. In particular, the consulate protesters demanded Mexico raise its minimum wage. They argue that the increase would not only benefit Mexican workers, but also workers in the United States and Canada, by making it less profitable for companies to move production to Mexico. The current minimum wage in Mexico is roughly $4 per day. Abraham Garcilazo Espinosa, a mineworker from Mexico City and representative of the Sindicato Minero (the National Union of Miners and Metalworkers), told In These Times that the wage disparity in the mining industry is especially glaring. “In Canada and the U.S., miners are doing the same thing we do in Mexico, often for the same companies, but Mexican miners are making a lot less money,” he said. “The work requires the same level of specialization, training and risk in all three countries, but with very different wages.” While the median monthly income of mineworkers in the United States and Canada is about $2600, in Mexico it’s about $600. Prompted by President Donald Trump, the NAFTA renegotiations began in August and are expected to continue into 2018. As part of his “America First” vision, which has been widely criticized for racist and xenophobic overtones, Trump wants to reverse the U.S. trade deficit with Canada and Mexico. Two key demands of the organizers who gathered in Chicago—ending corporate protections like the undemocratic Investor-State Dispute Settlement (ISDS) and making it easier for workers in all three countries to form unions—are not on the Trump administration’s agenda. Canadian Prime Minister Justin Trudeau has complained that the hostile legal environment for unions in the United States compared to Canada creates unfair labor market competition between the two countries. In response, Senator Elizabeth Warren introduced a bill last month that would prohibit states from passing anti-union “right-to-work” laws. Although Canada has fewer legal obstacles to forming unions, activists there say guest workers from Mexico and other countries are routinely exploited. “Canada bills [its guest worker program] as a best-practice model of labor mobility, but the workers have no mobility. They get fired if they speak up and have no recourse,” said Evelyn Encalada, a founding member of the Canadian nonprofit Justice for Migrant Workers who participated in last week’s meeting. “We want all workers in North America to have mobility, labor rights and the right to have rights,” Encalada told In These Times. The transnational solidarity on display last week is based on relationships that have developed over several years. The FAT and UE have been in a strategic alliance—consisting of worker-to-worker exchanges and cross-border organizing—since NAFTA’s original negotiations began in 1992. This August, the UE also entered into a new cooperation agreement with the progressive Canadian union Unifor. The Mexican unionists who visited Chicago hope to draw international support for activists with Sitrajor, the independent union of employees at the left-leaning Mexico City newspaper La Jornada. After Sitrajor staged a five-day strike to defend wages and benefits this summer, the company that owns the paper fired two of the union’s leaders. Activists say the dismissals were retaliatory and are calling for the fired workers to be reinstated. “International solidarity has been fundamental for the survival of our union in recent years,” explained Garcilazo Espinosa of the Sindicato Minero. His union’s leader, Napoleón Gómez Urrutia, was forced to flee to Canada in 2006 after the Mexican government—which he openly criticized—accused him of corruption and issued an arrest warrant. An appeals court overturned the warrant in 2014 for lack of evidence. Garcilazo Espinosa told In These Times the Sindicato Minero has withstood repression with the help of labor organizations around the world, including the United Steelworkers and the global union federation IndustriALL. The organizers at last week’s gathering agree that transnational labor solidarity is better for workers than Trump’s brand of nationalism. “I don’t know who invented those lines called borders, but everything Trump is saying about putting up a wall—we’re completely against all of that,” said Martínez.